What does the gender pay gap mean for women working in schools? Thousands of companies were required by the Government Equalities Office to publish their gender pay gap figures by 4 April 2018. Understandably, this watershed has resulted in wide coverage across the media. From 100 organisations with the largest median pay gap, over half are schools. However, the debate surrounding the gender pay gap largely concentrates on the private sector landscape. Attention grabbing reports that highlight the gender gap in the corporate world keep the gaze away from schools. Yet, one of the most compelling facts of the government’s data collection is shocking because it relates to education. Out of the 100 organisations with the largest median pay gap, over half are schools or academy trusts. The TES revealed that among the 227 schools and academy trusts the average of the median pay gaps was 27.4 per cent as compared with a median pay gap of 11.5 per cent nationally. This illustrates yet again that workforces largely dominated by women continue to remain on the margins of the wider conversation. The gender pay gap data collection, for example, does not compare the pay rates for men and women doing the same work. Instead it considers the average amount paid to men and women, regardless of their job. What else is missing? Remarkably, information on pay scale points and performance related pay outcomes awarded to men and women across the profession! These factors compound the inability to truly understand how many women are receiving equal pay. The gender gap at leadership levels is especially concerning. The NASUWT says that women are more likely to start their leadership journey on a lower salary than their male counterparts. In addition, we also know that women are asked to wait for pay progression until they have moved beyond a period of maternity leave. And what about the significant proportion of low paid, part-time women who work in schools? They are not included in the current data collection arrangements, but why? It is a real step forward that organisations of a certain size have to publish their gender pay gap information. However, we need to go deeper and identify the main barriers to progress for women. 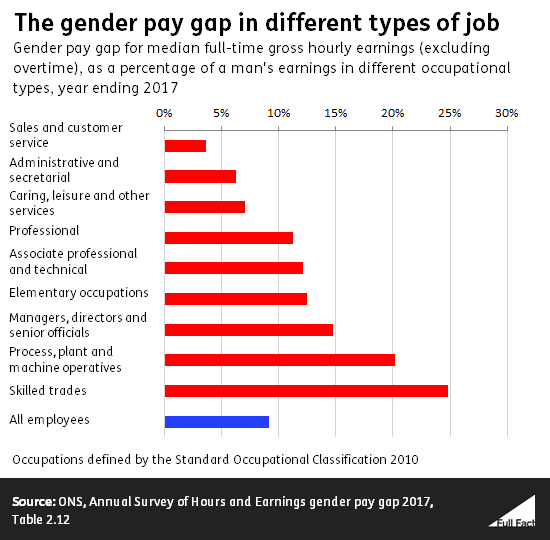 According to the Office for National Statistics, there isn’t a single number that adequately deals with all the issues surrounding differences between women and men’s pay. The Department for Education’s Initial Teacher Training (ITT) Census for 2017/18 is revealing. It shows that in England, only 20% of new entrants to postgraduate primary programmes were male. With so many women going into teaching, we need to look hard at helping female teachers through the most difficult years of having a young family. Furthermore, a wider recognition of, and commitment to, redressing the significant gender gap amongst school leaders is critical. Education is a profession that desperately needs to ensure that it is creating and cultivating an arena in which female teachers have the confidence and empowerment to progress into leadership. Addressing the Gender Pay Gap must be seen as just one path that must be taken on the journey to achieve true gender equality in education. Most of all, we must ensure the gender pay gap closes and ultimately disappears. The gender pay gap has been falling over time, but what about schools? Claire is a Head of Junior School at Sydenham High Junior School GDST. She gained her QTS in 2005 and started her career as an EYFS/KS1 specialist in a large state community infant school in Hounslow, West London where she developed an interest in EAL in EYFS, then moved to the independent sector where she worked in a variety of roles in large co-ed London prep schools including Head of Geography and English. In 2010 she took up her first SLT role as Head of Lower School at Ravenscourt Park Prep.